Prairie’s commitment to community and helping students grow in knowledge and respect – this is what made the school’s Diwali celebration on Friday, November 2nd so profound. It wasn’t just a moment for Prairie’s Indian students. Or Multicultural Club members. Or a small group of curious students. 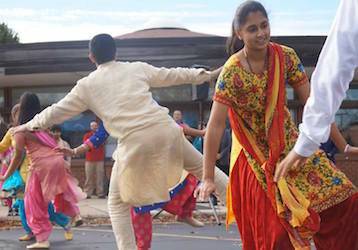 The celebration included traditional dress and food, displays of rangoli, cultural conversations and a thrilling Indian dance known as Bhangra. The above excerpt appeared in a story in the latest Prairie Magazine and Report of Giving. This entry was posted in All News, All School, Featured by Brendan O'Brien. Bookmark the permalink.